FastVein Time & Attendance » Application designed and developed by Thomas Alderson. A 2015 project, FastVein Time & Attendance is a web based application that connects to a program situated within a vein-scanning system, the user scans their finger and data is saved based on where the user scanned their finger and the date and time of the scan. 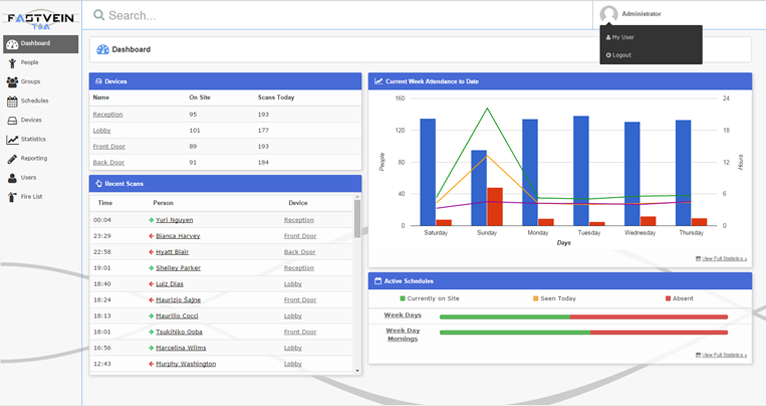 The web interface (developed in Ruby on Rails) then collects the saved data and generates graphs, tables and user profile-specific information that details the attendance of the scanned users.